For the next part of our Mass books, let's get into the Kyrie and the Gloria. Going forward I am planning on posting a new Mass part once a week. This time around it took me a while to post again because of having some other commitments this past week. If you're just popping in, make sure to read Part 1 and Part 2 to catch up to where we are. The Kyrie in the Extraordinary Form is said 3 times rather than twice as in the Ordinary Form. The recitation of the Kyrie is also known as the Penitential Rite and is an opportunity to ask the Lord for forgiveness. Here, our venial sins are cleansed from us in order to receive Holy Communion worthily. For our Mass books, the Kyrie can be very simple because, well, it is simple! 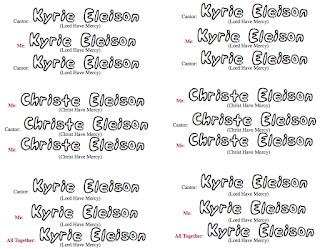 This worksheet shows the call and response of the Kyrie. Your child can color the Cantor's part one color and their a different color, or they can color each of the three sets the same... whatever makes sense to them!